Polyurethane Sprockets – Custom Urethane Sprockets! Polyurethane Sprockets ? You’ve come to the right source! Polyurethane Conveyor Drive Sprockets: Polyurethane conveyor drive sprockets are found in many industries such as food production and health products that specify polyurethane sprockets. Since polyurethane is resistant to harsh environments from heat, chemicals, solvents and abrasion as urethane has great abrasion resistance and excellent load-bearing performance. Urethane Drive Sprockets: Urethane drive sprockets are very common industrial OEM parts. Urethane drive sprockets are made from tough durable urethane normally found in many applications and will outlast similar materials in any condition or climate. Urethane will absorb and impact or mismatch and run quiet and smooth vs steel sprockets. Urethane Drive Sprockets are available in low volume or to reproduce a discontinued urethane drive sprocket. Polyurethane Chain Sprockets: Polyurethane is an ideal choice of material for chain sprockets due to the ability to absorb an impact and return to the original sizes even after years of repeated abuse even in underwater or outdoor environments. Plan Tech can also reverse engineer any existing polyurethane chain sprockets in rapid time. Urethane Gear Sprockets: Urethane Gear Sprockets are designed to operate quietly for high demand applications. Urethane has a great ability to absorb an impact resulting in smooth operation and extended runtime vs similar materials. Polyurethane resins have superior physical properties making urethane gear sprockets a go-to choice when choosing a high-performance material. Urethane gear sprockets can easily be molded to size resulting in low-cost high volume applications that often times have little tooling start-up cost on new urethane gear sprockets. Kimpex Urethane Track Sprockets – reproduced: Kimpex urethane track sprockets – reproduced are used in many industries requiring high-performance urethane sprockets and parts. From Snowmobiles to Agriculture Equipment Plan Tech manufactures reproduction Kimpex urethane track sprockets – reproduced for customers worldwide. We are a leading urethane sprockets manufacturer in the United States and have been producing custom molded urethane sprockets for over 30 years! Snowcat Urethane Drive Sprockets: Snowcat Urethane Drive Sprockets are custom cast for critical design specifications and will meet the highest quality standards. Plan Tech offers snowcat drive sprockets with up to 60% greater strength vs similar material for industries that require high-performance snowcat urethane drive sprockets. Our snowcat urethane drive sprockets provide a long service life and reliable performance that are precision cast from high-quality polyurethane material supplied by world leaders. Conveyor Urethane Idler Sprockets: There are conveyor urethane idler sprockets found in several applications in roller chain sprockets, power transmission sprockets, drive sprockets as well as idler sprockets. In fact, increase in the applications of conveyor urethane idler sprockets is directly proportional to an increase in the automation of industries. Polyurethane Drive Sprockets: Polyurethane drive sprockets will also adapt to any slight mismatch in the operation or any debris that might get caught in between the sprocket and track. Most commonly we have found 50D hardness sprockets will have extended service life with great physical properties. FDA tight tolerance polyurethane drive sprockets are also available with additives like PolyMag available to make the polyurethane detectable in existing X-ray equipment in case of a failure. 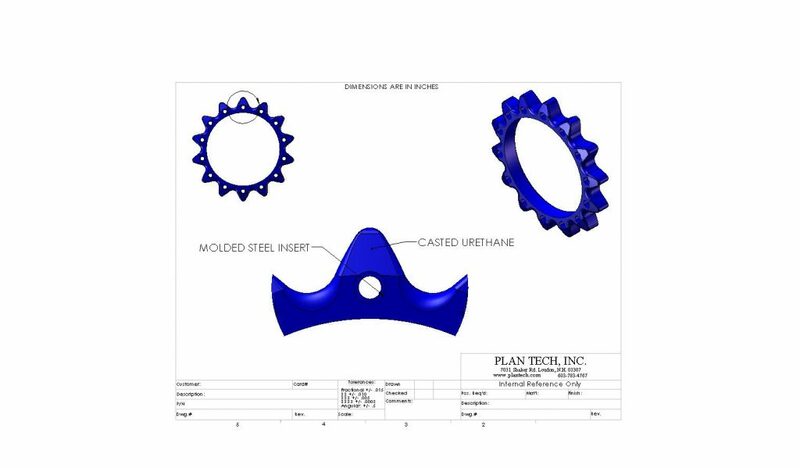 Urethane Roller Chain Sprockets: Urethane roller chain sprockets are extremely popular and one of Plan Tech’s most required custom urethane molded parts. With thousands of different application possibilities, Plan Tech is able to produce tooling to match any profile roller chain and mass produce urethane roller chain sprockets in high volume with rapid turn around. Tight Tolerance Urethane Sprockets: Plan Tech produces hundreds of thousands of tight tolerance urethane sprockets around the world each year for a wide variety of applications. Most commonly we hear our sprockets drive a track in food processing equipment on large machinery. Urethane Idler Sprockets: Many applications for urethane idler sprockets are found in power transmission sprockets, idler sprockets, roller chain sprockets and drive sprockets. As the automation of industries increase, the applications for urethane idler sprockets would also increase. Sprockets are increasingly being used in the production lines as well as the assembly lines in order to make the movement of objects smoother. 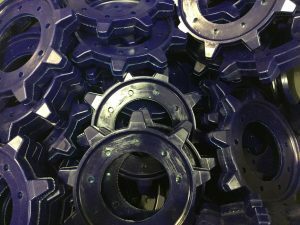 Polyurethane sprockets also have unique noise abatement properties not possible with metal parts resulting in quieter operating machines that will also help absorb vibration. In addition to manufacturing brand new polyurethane sprockets, we also offer re-coating services. Existing rubber sprockets with a hub or core that is still in good shape can be re-coated, cleaned and refurbished with a new urethane coating. New and recovered rubber sprockets can be manufactured to withstand a variety of load weights at variable RPMs. We can also produce replacement rubber or steel sprockets for an existing part to match OEM profiles perfectly. We use precise measuring gauges and testing equipment to meet tight tolerances that our customers require for their sprockets. The tests are typically performed according to an established set of standards provided by an accredited testing organization such as the Society for Testing and Materials (ASTM) who define the procedures in detail. For over 30 years we have focused on using speed and precision to rapidly deliver the highest quality industrial cast polyurethane sprockets to our customers. Our custom cast polyurethane facility maintains world-class capabilities and equipment, combined with excellent quality systems. A particular strength is the breadth of our in-house capabilities which, when combined with our extensive experience, enables us to rapidly deliver tight tolerance poly sprockets while maintaining the quality control and cost effectiveness our customers need. 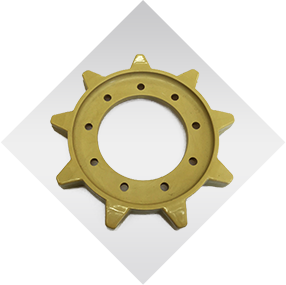 Please Contact us for further details regarding custom cast polyurethane sprockets!